Subscribe to the O’Reilly Hardware Podcast for insight and analysis about the Internet of Things and the worlds of hardware, software, and manufacturing. Almost everything revolves around getting IP protection in place, and patent lawyer meetings are usually the first sign that your spin-off is on the way. But what if there was a way to avoid the patent dance, relying instead on implementation? It seems somewhat utopian, but there is a precedent in the technology world: open source. What is open source? Essentially, any software in which the source code (the underlying program) is available to anyone else to modify, distribute, etc. This means that, unlike typical proprietary development processes, it lends itself to collaborative development between larger groups, often spread out across large distances. From humble beginnings, the open source movement has developed to the point of providing operating systems (e.g. Linux), Internet browsers (Firefox), 3D modelling software (Blender), monetary alternatives (Bitcoin), and even integrating automation systems for your home (OpenHab). The obvious question is then, “OK, but how do they make money?” The answer to this lies not in attempting to profit from the software code itself, but rather from its implementation as well as the applications which are built on top of it. For the implementation side, take Red Hat Inc., a multinational software company in the S&P 500 with a market cap of $14.2 billion, who produce the extremely popular Red Hat Enterprise Linux distribution. Although open source and freely available, Red Hat makes its money by selling a thoroughly bug-tested operating system and then contracting to provide support for 10 years. Thus, businesses are not buying the code; they are buying a rapid response to any problems. 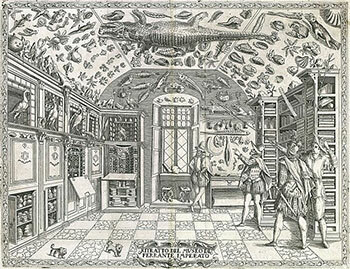 Download the new issue of BioCoder, our newsletter covering the biological revolution. I recently took part in a panel at Engineering Biology for Science & Industry, where I talked about the path biology is taking as it becomes more and more of an engineering discipline, and how understanding the path electronics followed will help us build our own hopes and dreams for the biological revolution. In 1901, Marconi started the age of radio, and really the age of electronics, with the “first” trans-atlantic radio transmission. It’s an interesting starting point, because important as this event was, there’s good reason to believe that it never really happened. We know a fair amount about the equipment and the frequencies Marconi was using: we know how much power he was transmitting (a lot), how sensitive his receiver was (awful), and how good his antenna was (not very). Software developers and hardware engineers team up with biologists to address laboratory inefficiencies. Download a free copy of the new edition of BioCoder, our newsletter covering the biological revolution. Following the Synthetic Biology Leadership Excellence Accelerator Program (LEAP) showcase, I met with fellows Mackenzie Cowell, co-founder of DIYbio.org, and Edward Perello, co-founder of Desktop Genetics. Cowell and Perello both wanted to know what processes in laboratory research are inefficient and how we can eliminate or optimize them. One solution we’re finding promising is pairing software developers and hardware engineers with biologists in academic labs or biotech companies to engineer small fixes, which could result in monumental increases in research productivity. BioCoder 8: neuroscience, robotics, gene editing, microbiome sequence analysis, and more. 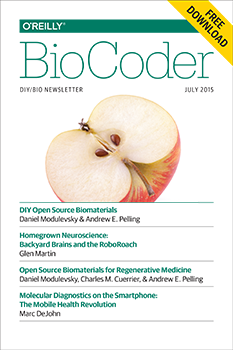 We are thrilled to announce the eighth issue of BioCoder. This marks two years of diverse, educational, and cutting-edge content, and this issue is no exception. Highlighted in this issue are technologies and tools that span neuroscience, diagnostics, robotics, gene editing, microbiome sequence analysis, and more. Glen Martin interviewed Tim Marzullo, co-founder of Backyard Brains, to learn more about how their easy-to-use kits, like the RoboRoach, demonstrate how nervous systems work. Marc DeJohn from Biomeme discusses their smartphone diagnostics technology for on-site gene detection of disease, biothreat targets, and much more. Daniel Modulevsky, Charles Cuerrier, and Andrew Pelling from Pelling Lab at the University of Ottawa discuss different types of open source biomaterials for regenerative medicine and their use of de-cellularized apple tissue to generate 3D scaffolds for cells. If you follow their tutorial, you can do it, too! Buy “BioBuilder: Synthetic Biology in the Lab,” by Natalie Kuldell PhD., Rachel Bernstein, Karen Ingram, and Kathryn M. Hart. The O'Reilly Radar Podcast: Tim Gardner on the synthetic biology landscape, lab automation, and the problem of reproducibility. Editor’s note: this podcast is part of our investigation into synthetic biology and bioengineering. For more on these topics, download a free copy of the new edition of BioCoder, our quarterly publication covering the biological revolution. Free downloads for all past editions are also available. Tim Gardner, founder of Riffyn, has recently been working with the Synthetic Biology Working Group of the European Commission Scientific Committees to define synthetic biology, assess the risk assessment methodologies, and then describe research areas. I caught up with Gardner for this Radar Podcast episode to talk about the synthetic biology landscape and issues in research and experimentation that he’s addressing at Riffyn. Editor’s note: this post is part of our ongoing investigation into synthetic biology and bioengineering. For more on these areas, download the latest free edition of BioCoder. Over the last six months, I’ve had a number of conversations about lab practice. In one, Tim Gardner of Riffyn told me about a gene transformation experiment he did in grad school. As he was new to the lab, he asked two more experienced scientists for their protocol: one said it must be done exactly at 42 C for 45 seconds, the other said exactly 37 C for 90 seconds. When he ran the experiment, Tim discovered that the temperature actually didn’t matter much. A broad range of temperatures and times would work. In an unrelated conversation, DJ Kleinbaum of Emerald Cloud Lab told me about students who would only use their “lucky machine” in their work. Why, given a choice of lab equipment, did one of two apparently identical machines give “good” results for a some experiment, while the other one didn’t? Nobody knew. Perhaps it is the tubing that connects the machine to the rest of the experiment; perhaps it is some valve somewhere; perhaps it is some quirk of the machine’s calibration. The more people I talked to, the more stories I heard: labs where the experimental protocols weren’t written down, but were handed down from mentor to student. Labs where there was a shared common knowledge of how to do things, but where that shared culture never made it outside, not even to the lab down the hall. There’s no need to write it down or publish stuff that’s “obvious” or that “everyone knows.” As someone who is more familiar with literature than with biology labs, this behavior was immediately recognizable: we’re in the land of mythology, not science. 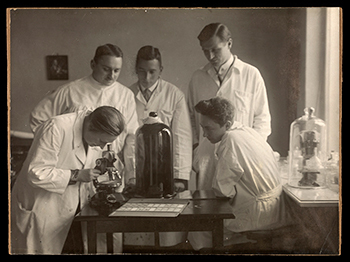 Each lab has its own ritualized behavior that “works.” Whether it’s protocols, lucky machines, or common knowledge that’s picked up by every student in the lab (but which might not be the same from lab to lab), the process of doing science is an odd mixture of rigor and folklore. Everybody knows that you use 42 C for 45 seconds, but nobody really knows why. It’s just what you do. 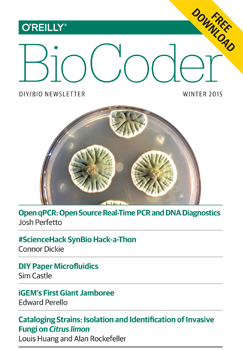 Today, we’ve released the 6th issue of BioCoder. There’s a lot of great content, including a report from iGEM’s first Giant Jamboree, and an update from the #ScienceHack Hack-a-thon. We’ve also got a report on the Open qPCR project, which reduces the cost of real-time PCR by a factor of 10, and an article about bringing microfluidics into the DIY lab. 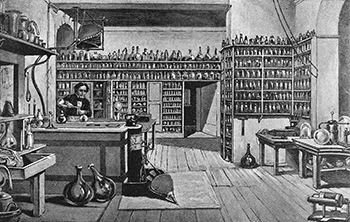 There’s nothing more disruptive than taking exotic and expensive techniques and putting them in the hands of experimenters. Once again, we’re interested in your ideas and in new content, so if you have an article or a proposal for an article, send it in to BioCoder@oreilly.com. We’re very interested in what you’re doing. There are many, many fascinating projects that aren’t getting media attention. We’d like to shine some light on those. If you’re running one of them — or if you know of one, and would like to hear more about it — let us know. We’d also like to hear more about exciting start-ups. Who do you know that’s doing something amazing? And if it’s you, don’t be shy: tell us. Above all, don’t hesitate to spread the word. BioCoder was meant to be shared. Our goal with BioCoder is to be the nervous system for a large and diverse but poorly connected community. We’re making progress, but we need you to help make the connections.